Lots of racing today. Hot diggity! First, there is the ongoing Tour de Suisse (Tour of Switzerland). Today is stage 5, 237.3 kilometers going from Unterterzen to Sölden. With the finish atop the HC-ranked Sölden/Rettenbacherner ascent, the General Classification should get a real shakeup. By the way, I didn't get photos for the Swiss races stage 3 until Tuesday morning. They are posted and you can see them along with the complete 3 results here. Two races start today. There is the Women's Tour of Britain. I've got the start list, stage one map and profile posted. Also the Dutch Ster ZLM Toer 6.6 kilometer prologue gets that race going. If you bought a bike from Gus’ Bike Shop in North Hampton in the past few months, there’s a good chance it was put together by Scott Brown. The former Republican U.S. senator from Massachusetts started volunteering at the store in December, about a month after narrowly losing the Senate race to Democrat Jeanne Shaheen. Since then, Brown has learned the basics of bike maintenance and repair. He’s also assembled almost 40 bikes under the guidance of longtime mechanic Dean Merrill. “Back in December, I came in and said, ‘Listen, I don’t need a job, I don’t need any money, but I’ve always wanted to learn how to put together and take apart bikes',” Brown said during a recent interview. Brown is an avid cyclist and tri-athlete who owns a high-end Felt racing bike, but he came in with relatively little experience in bike repair. He’s starting to feel more confident and he’s served as the on-site bike mechanic for recent cycling events in Rye. “I kind of like it. It gets me out of the house and it gets me doing different things,” he said. During a recent visit to Gus' Bike Shop on Lafayette Road, Brown took a break from truing a bike wheel to discuss presidential politics, the New Hampshire primary, Congressman Frank Guinta’s illegal campaign contributions and his plans for the future. Since last fall's election, Brown has returned to Fox News and traveled around the country for speaking engagements. He also serves on corporate boards and has gotten involved in several local fundraisers and causes on the Seacoast. Up next, Brown will host a June 25 fundraiser at the Old Salt in Hampton featuring comedians to raise money for the Save the Indoor Portsmouth Pool organization. Brown follows the 2016 presidential election on a daily basis and he has met with or spoken with nearly all of the Republican candidates, many of whom sought his advice for campaigning in the Granite State. He’s planning to endorse a candidate but not for some time. As more Republicans formally announce a run for president, he expects those who pursue a traditional New Hampshire campaign will have the best chance of emerging from the crowded GOP field. “They are going to come here, spend some time, hold town halls, go door to door and sit in people’s businesses and living rooms, and look them in the eye and answer their questions. That is what New Hampshire demands,” he said. “He is going to have to do what is right for himself and his family but also for the party and the state, and I think ultimately that will take care of itself one way or another,” Brown said. Brown won a special election for the U.S. Senate in Massachusetts in 2010 and left office after losing the 2012 election to Democrat Elizabeth Warren. He and wife, Gail Huff, moved full time to their Rye vacation home in late 2013. There are things Brown misses about the U.S. Senate, particularly the ability to help constituents. During his time in office, he said he helped people obtain organ transplants, finalize adoptions and receive health care through the Veterans Administration. While he didn’t rule out another political run, Brown doesn’t seem all that anxious to mount another campaign. He won’t sit the 2016 election out, though. He plans to campaign next year for N.H. Republican Sen. Kelly Ayotte, who is expected to seek a second term in the U.S. Senate. Scott Brown trues a wheel at Gus' Bike Shop. For now anyway, Brown is spending a few days a week at Gus’ Bike Shop, where he’s one of eight or nine regular bike mechanics. Usually, he puts together bikes, which can take 40 minutes or four hours. “I go up, drag it down, rip it out of the box and then basically you pull it apart and you put it all together,” he said. 2015 Giro d’Italia stage winner Michael Matthews has capitalised on a strong final by ORICA-GreenEDGE to sprint to victory on stage four of the Tour de Suisse. The Australian outfit, including local Suisse rider Michael Albasini, hit the front for much of the last 40km, before Matthews launched from the wheel of Peter Sagan (Tinkoff – Sagan) to take the win. Matthews benefited from the full commitment of the entire ORICA-GreenEDGE team, but particularly thanked Albasini for sacrificing himself in his home area for the team victory. Michael Matthews wins Swiss Tour stage 4. Sport director Neil Stephens said Albasini had identified the stage as a good target for Matthews before the Tour started and the team were prepared to put it all on the road for the result. They made a conscious effort to rid as many riders as they could to eliminate threats. “Today was a really big objective,” Stephens said. “It was a stage we knew we wanted to go well in and it was a stage we were not afraid to put ourselves on the line to go for the victory. First up, we wanted to work hard to eliminate the pure sprinters like Alexander Kristoff and Mark Cavendish. They were never allowed a lot of freedom, their advantage never extending much beyond three-minutes. A three-circuit final, including the category three Kirchberg climb, was enough to shred the pure sprinters and leave today’s stage to be contested by the punchy fast men. Schwarzenbach, Switzerland - Greg Van Avermaet finished third and Silvan Dillier was seventh for the BMC Racing Team in Tuesday's bunch sprint finish at the Tour de Suisse. Michael Matthews (ORICA-GreenEDGE) took the win ahead of Monday's winner, Peter Sagan (Tinkoff-Saxo), as Van Avermaet earned his 11th top three result of the season. Dillier's result was a season best. He was also first among all Swiss riders on the stage. BMC Racing Team Sport Director Fabio Baldato said the combination of a moderately hard climbing, combined with a slightly uphill finish, made the 193.2-kilometer race a perfect one for Van Avermaet. 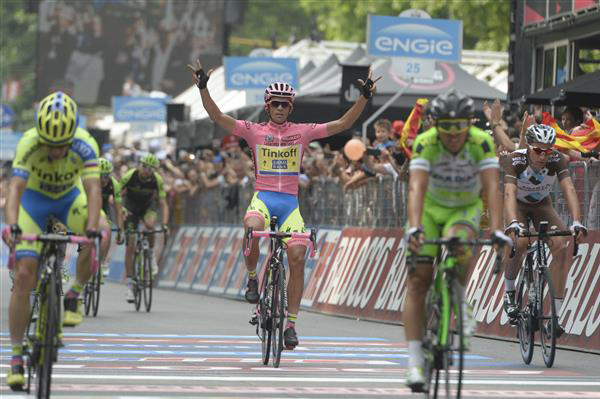 "It was a perfect parcours for him," Baldato said. "Greg is there. He is really good. He did a good job to be in position. The work from Danilo Wyss to help him today was really amazing." Van Avermaet said he found himself near the front a bit earlier than he expected after Matthews' team stopped its sprint lead out with 500 meters to go. "On a finish line this, you can get boxed in, so I waited a few moments to launch my sprint," Van Avermaet said. "I went a little bit too early in the sprint. For sure, it would be hard to beat Matthews in a sprint like this. But I tried and I am pretty happy with my third place." In the overall standings, Tom Dumoulin (Team Giant-Alpecin) kept the lead while BMC Racing Team's Ben Hermans finished in the front group again to remain 36 seconds off the lead in 12th place. Wednesday's stage is 237.3 km and features a mountain-top finish at the ski station in Sölden, Austria. "Ben is still there, Baldato said. "He has the experience and has been keeping his tempo on the climbs. it will be a hard climb for him, but I am confident he can do a good stage and if he loses time, then maybe he can get it back in the final time trial." 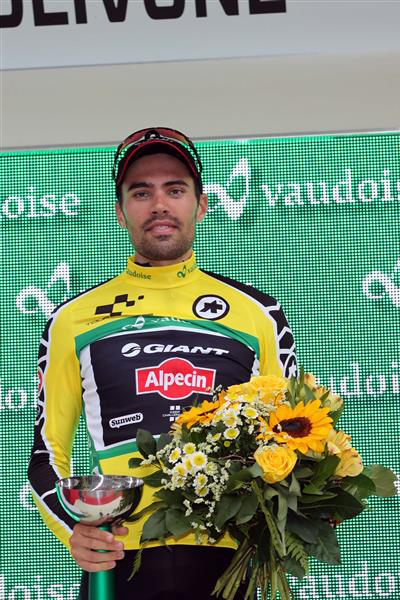 Kristijan Durasek was once again very competitive in the Tour de Suisse. The Croatian cyclist succeded in being in the head group in the fourth stage, 193.2 km from Flims to Schwarzenbach with the 2nd category KOM of Wildhaus (68.7 km into the race) and hilly final part of the course being three laps of a circuit with Husenstrasse-Kirchberg ascent. The pure sprinters were dropped from the bunch by the high pace in the circuit, so Lampre-Merida could not count on Cimolai (who's improving his form in view of the Tour de France). Conti and Pibernik tried hard to resist in the head group, but they had to give up on the final passage on the KOM, so Durasek had the responsibility of the blue-fuchsia-green colors. This is the comment by Durasek about the final part of the race: "I had good feedback from my legs, so I wanted to exploit these great feelings. Considering that there were still in the head group riders faster than me, such as Matthews, Sagan and Van Avermaet, my project was to try an attack in the final kilometer. Unfortunately, a rider from Movistar crashed and so I was unbable perform my attempt. We were in the last three kilometers, that's why the situation in the overall classification did not change". Durasek was 29th at the arrival, the stage was won by Matthews. The overall classification is led by Dumoulin, Durasek is 8th at 21". 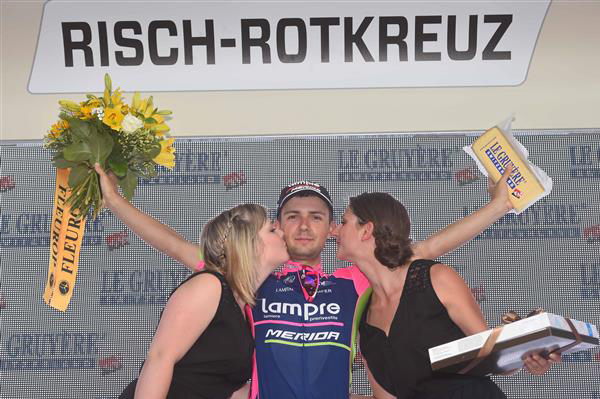 For the 4th stage, Lampre-Merida pulled Xu Gang. Taking into account his future participation in the Tour of Qinghai Lake, the Chinese rider agreed with the team doctor to quit the Swiss race in order to preserve the leg which had been injuried in a crash during the 2nd stage. Alberto Contador will return to competition on Thursday, June 18th, after being proclaimed winner of the Giro d'Italia on May 31st. After fifteen days of active rest, Alberto is very motivated in view of his next challenge, the Tour de France. “If it were easy I wouldn't have this motivation. I hope to reach the start in top condition," states Tinkoff-Saxo's leader two days before the start of the Route du Sud. "Physically and muscularly I still feel the wear from the Giro, especially that of the final week, which was very hard. As a result, I tried above all to rest as much as possible during this time," stated Alberto Contador. “I focused on recovering and I have only done three days of specific training to activate my body." How do you think you will feel in the four stages of the Route du Sud? "For me it is an unknown. I can't know now in what form I will be. I took great care of all the details, both rest and nutrition, which is somewhat complicated, because you have to eat little, just the opposite of what happens in a competition. The most important thing is that I look forward to racing in the Route du Sud because it will give me speed in the legs and I will be in motion again. Surely, it will take some time to ramp up, but I have a good foundation and this will allow me to carry out a good training in racing mode." Do you already think about the Tour de France? How do you see it right now? "I see it with uncertainty, but also with the motivation to experience something that is new to me. I'm mentally very excited and motivated with this challenge. Physically, when I get up, my legs still hurt, I feel some muscle fatigue, but this is normal. If it were easy, I wouldn't have this motivation and, on second thought, there are still more days ahead to recover than days that have passed since the end of the Giro. I hope to reach the start in top condition." "After going to Pinto to celebrate the victory with my friends and family, I went to Lugano and from there to Livigno, where I was isolated and concentrated. It's a good place, with iconic mountain passes very close, such as Gavia and Stelvio, but also with the possibility to train in flat terrain at an altitude of 1,800 meters. I took advantage of this to prepare my return to competition, although I will face this race in a more relaxed mode." It’s the one stage race after the other. The Critérium du Dauphiné came to an end yesterday, there is a peloton riding the Tour de Suisse and on Wednesday the Ster ZLM Toer begins. That’s a Dutch race on the Europe Tour calendar from Wednesday 17th June until Sunday 21st June. The Ster ZLM Toer starts Wednesday evening with a prologue of 6.4 kilometres in the streets of Goes. The second stage is a complete flat one. The riders can explore the finish line four times before the actual end. First there are two big loops, then three laps of about fifteen kilometres. It’s very likely a bunch sprint will decide about the victory. Friday the race takes place in the province of Limburg, that means the course is hilly. There are six mountain sprints: Cauberg, Bemelerberg, Loorberg, Camerig, Gulperberg and Eyserbosweg. From the top of the last official climb it’s just less than one hundred kilometres to go. That doesn’t mean it’s flat afterwards. In the two local laps of 8.3 kilometres at the end the course is less difficult. Last year Greg Henderson was the best in Buchten. Like the previous years the Ster ZLM Toer visits Belgium. There are again six mountain sprints on the course, but on Saturday they are more spread than in the third stage. One of them is on the famous La Redoute climb. The last sprint is on the hill where the finish line is drawn. Then there are two laps of 16.5 kilometres left to go. On the last day, when the race is back in the Netherlands, the sprinters have a new big chance in the stage to Boxtel, where André Greipel won last year. For André Greipel the Ster ZLM Toer is his last race, except for the German Championships, before the Tour de France. Lotto Soudal's team selection: Lars Bak, Sean De Bie, Jens Debusschere, André Greipel, Adam Hansen, Greg Henderson, Marcel Sieberg and Dennis Vanendert.